Greetings to the Member for Medway (Hempstead with Eccles is the clue ) and upon whose support I may need to rely in order to get the Bill passed and turned into an Act. Currently I have three tentative plans in mind. Which, if any, can be built will depend on our future circumstances. That looks likely to be a 1 or 2 bedroom rented flat for at least the short term and with move-on accommodation not even thought about yet. What ever happens there will be opportunities to share in the development and enjoyment of a new project. Whether it's 100% new or includes parts or individual items I already have who knows? Everything I can reasonably recycle from Penhayle Bay will be packed and brought over and there's a collection of items which have never, or very seldom, been seen on the forums which would form the basis of something different. The Member For North Norfolk would like to propose thay we stop transporting people to southern continents, as this has sadly allowed a persons understanding of geography to fail. There are many Hempsteads in the UK but this one is one of two in North Norfolk!! There are many Eccles in the UK but this one is one of two in Norfolk!! One hopes your future building will be more successful than the railway that should have passed my house, it was proposed, approved started but never completed, more than a few embankments. Have the honourable members for North Norfolk and Far Away Yet Close At Hand, considered that the proposed line would be in direct competition with the existing Great Eastern main line and the South Eastern and Chatham Railway. Have they also considered the cost of any new crossing of the Thames estuary. Is there to be another bridge at Dartford, or is a tunnel being considered. The Member for Far Away Yet Close At Hand (In Images Of Elsewhere) asserts his position. That position is currently sedentary in the Thinking Chair. There would be no direct competition from here and no new crossing of the Thames. There might however be some furtling in the waddlemarsh or alternatively some hyper-expansion of the rails on a very hot day to extend them beyond Penzance. Or not. Or something else altogether. The proposal is from the Medway visiting Dunwich, Easton Bavents, Alnesbourne,Newton, California, Waxham Parva, Eccles on Sea, Keswick, Shipden, Blakeney, Sunny Hunny, North Lynn, enroute to Kings Lynn. Using the Brighton and Rottingdean Seashore Electric Railway format. That way we avoid problems with land owners, Branch lines will include up the River Yare to Norwich, The River Chemer to Chelmsford and that little place of Minor importance errr... London. The member for West Essex is pleased to hear that any proposed new line will be in the west of the country and not in direct competition with the Great Eastern Railway, to which (ahem) this member has no direct connection. In the meantime Penhayle Bay is still running and a few little jobs are still being done to keep it in good shape. 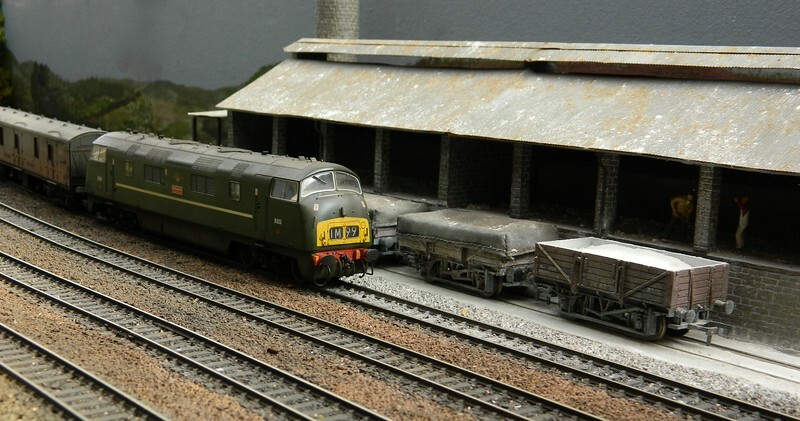 Coupled behind the Peak is the recently-purchased Hi-bar wagon which was weathered by its previous owner. 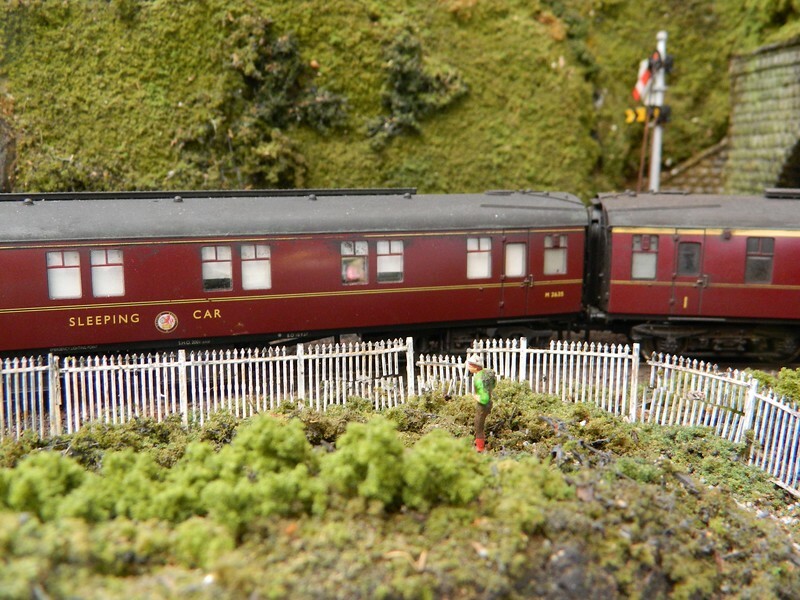 This is a Mainline-style (Bachmann-badged) wagon which arrived with plastic wheels. These have been replaced with new metal wheels to advantage. 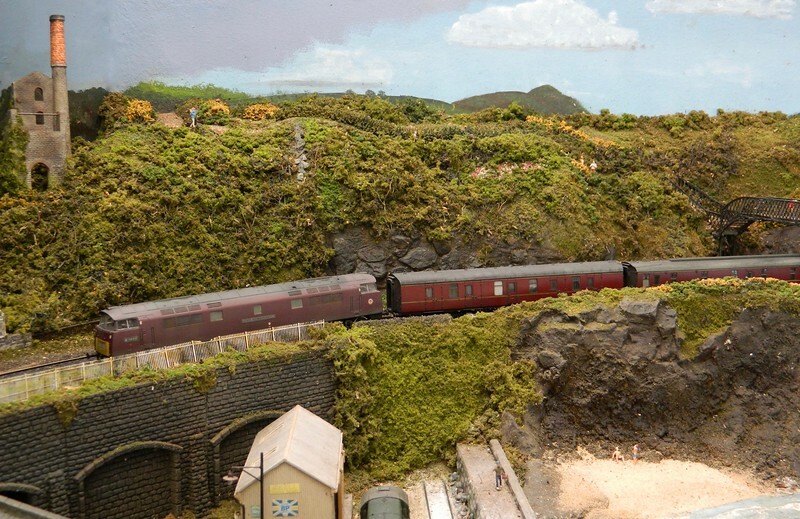 Also on the curve below Wheal Julia and on the cliffs above the beach a maroon "Western" leads the overnight sleeping car train, luggage van first behind the loco, from which a few curious faces peek from behind the blinds to see where the night's journey has brought them. The fence here was damaged some time ago by a roaming possum. I have intentionally left it as a fence in need of some repairs. Full-size Warships and a Baby Warship, I see. How'd you chase the possum off? Did you use an engine? Full-size Warships and a Baby Warship but alas no North British A1A-A1A Warships of the D600 type. 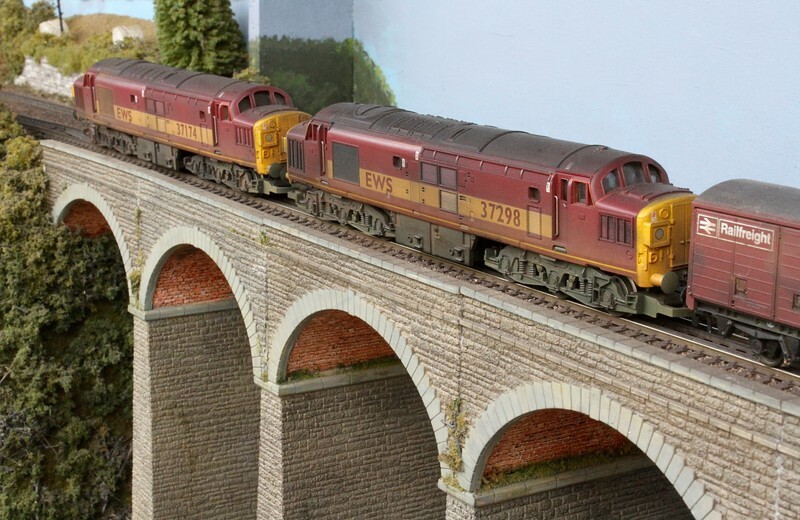 Despite high hopes they have proved to be too long in gestation for this layout (unless something very unexpected happens in the next few months) and my order will have to be reviewed. Possums are a nightly event. Sometimes they stroll casually around the place and at other times there seems to be some sort of possum festival taking place on the roof through the night. We can't do anything about them as they are protected native creatures. Even removing them from one house to the neighbour's is unlawful. Over the years I have tried several methods of excluding them from the railway the most successful of which is the current use of slack bird netting across the end weighted very firmly at ground level to prevent them lifting it. They were never violently destructive and their excursions on the railway seemed confined to quite careful walks. 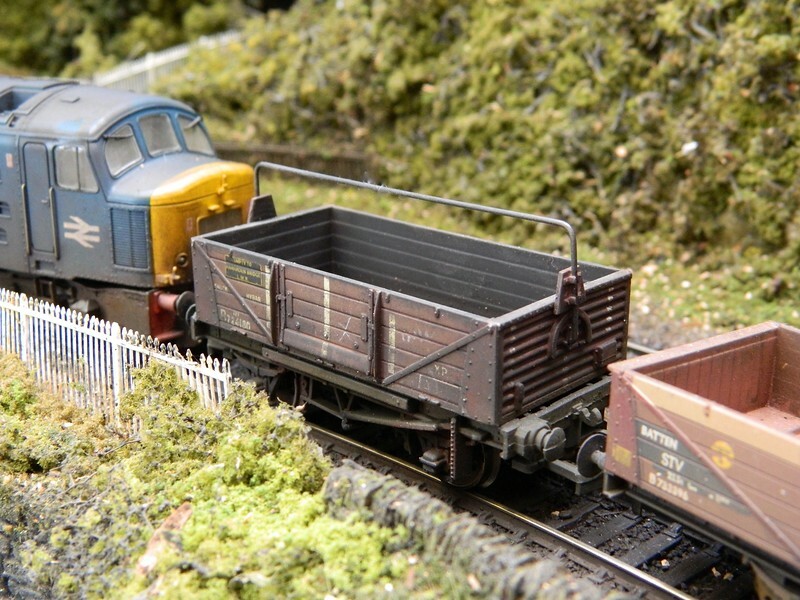 The occasional scenic item was damaged; a few wagons were derailed. A few pieces of solid waste had to be removed and twice I have had to redecorate a hillside after it was used as a lavatory. All in all the joys of working in the great outdoors. Offset by the fantastic (but also sometimes frustrating) natural light which has helped with so many of the images I have shared down the years. Your possums must be better trained (or of a higher class) than ours! Ours jump and thump over our roof at high speed wearing size 13 hobnail boots! The Western Region of British Railways hereby give notice that on and from a date to be specified but not later than Easter Monday 17th April 2017 the railway passenger and freight services on the Penhayle Bay Railway will be withdrawn. 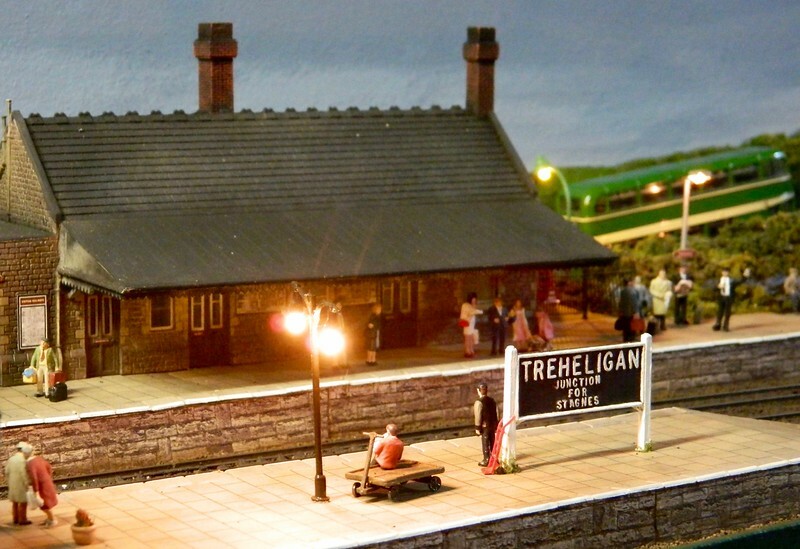 PENHAYLE BAY and TREHELIGAN stations will be closed to all traffic. PONSANGWYN goods depot will also close to all traffic. The line between Treheligan and St. Agnes will also close to all traffic. The Secretary of State for the Environment has consented to the above closures which will take effect EARLIER than the date stated if circumstances so require. Bus services in the area are also operated to and from Newton Broadway station. If objections are received to this proposal negotiations may be entered into with person or persons willing to ensure the future of all or parts of the Penhayle Bay Railway. 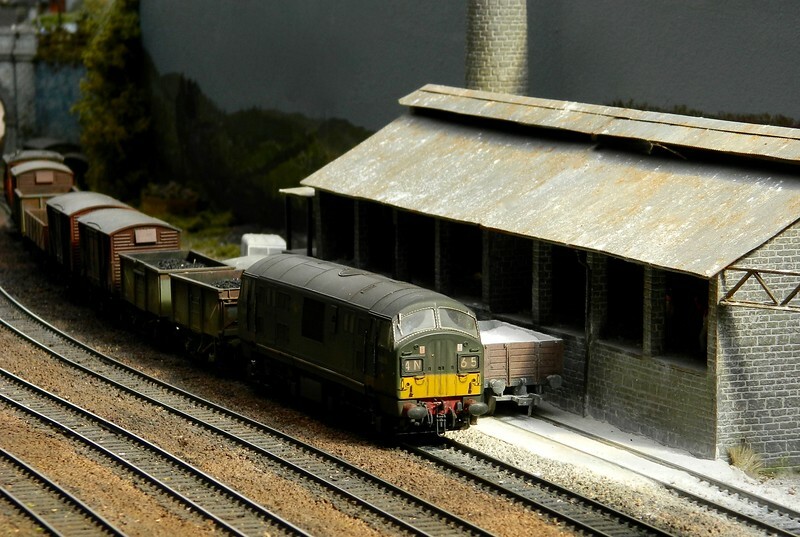 An objection has been lodged by a person offering potential storage for a segmented layout against a future return to these shores or sale as a restorable work at some future time. 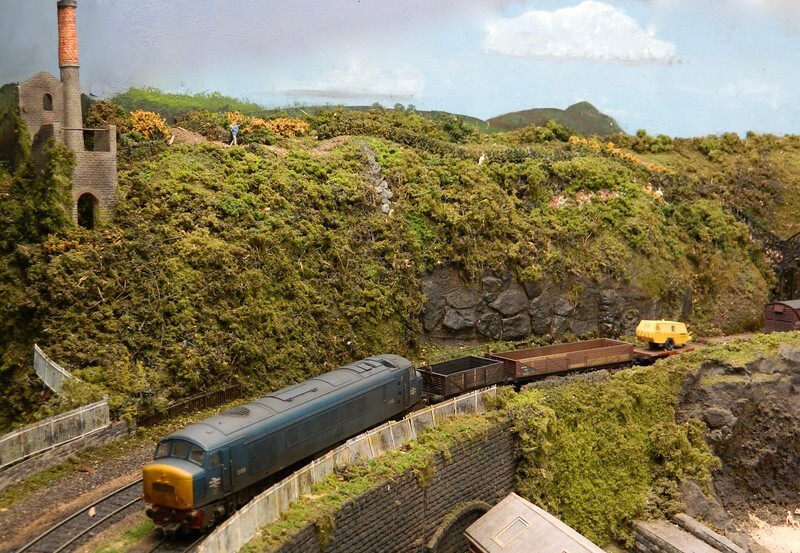 The layout is unlikely to dismantle neatly and considerable work would be required, as well as space, to restore it to working order in the future as all wiring would be cut and there would be disturbance to the track. However if it offers an alternative to stripping the re-useable parts and scrapping the rest then it would appear to have merit. The Board must now hold a Public Enquiry into the future of the Penhayle Bay Railway. Details will be made available to anyone present on 15th October for the running day or afterwards by published handbill or notice. 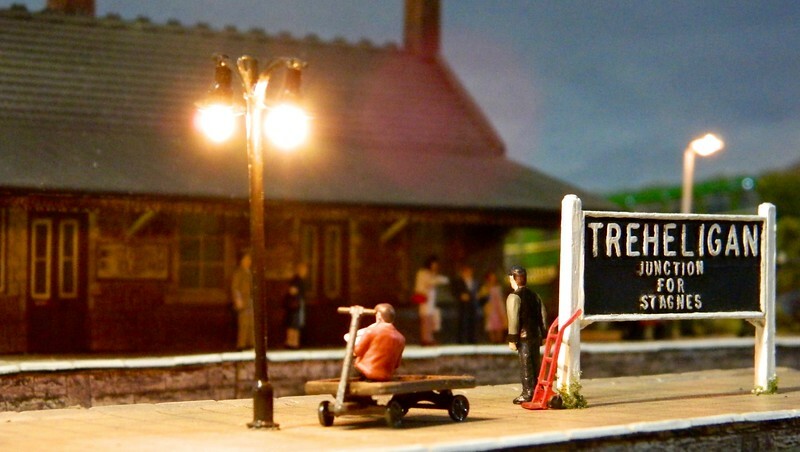 The railway cannot now close until the Public Enquiry has been held and submissions received and considered. The member for North Norfolk is greatly relieved that there is a proposal to mothball the Penhale Bay line, and wholly supports the proposal to do so and hopes to see it reopen soon. 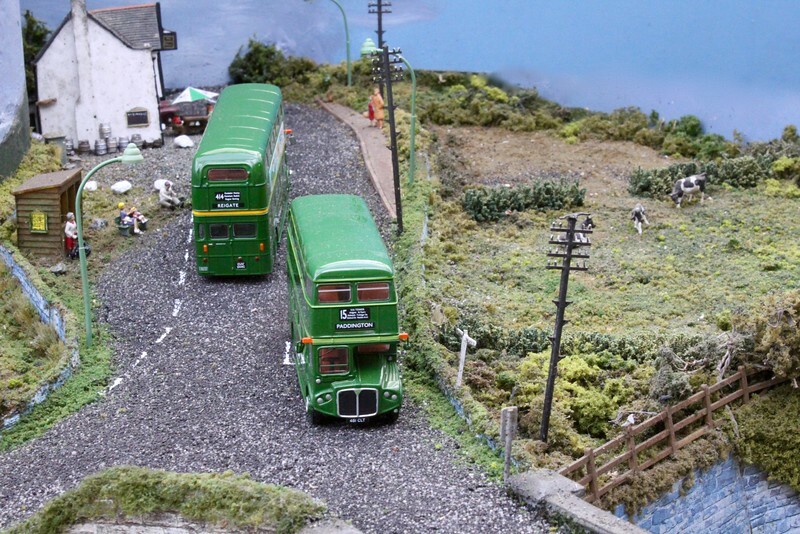 The final Penhayle Bus Rally took place this week. This has been an annual event in the fairly restricted car park at the beach and has featured vehicles from different areas and eras both parked for judging and inspection and offering rides around the area. A Mercedes minibus from the now-defunct but recent-era Western Greyhound is parked alongside a much older Bedford from the Bere Regis & District fleet. The first Leyland Atlantean in the City of Portsmouth fleet is beyond and at the far end is a Brighton, Hove & District Bristol FS. 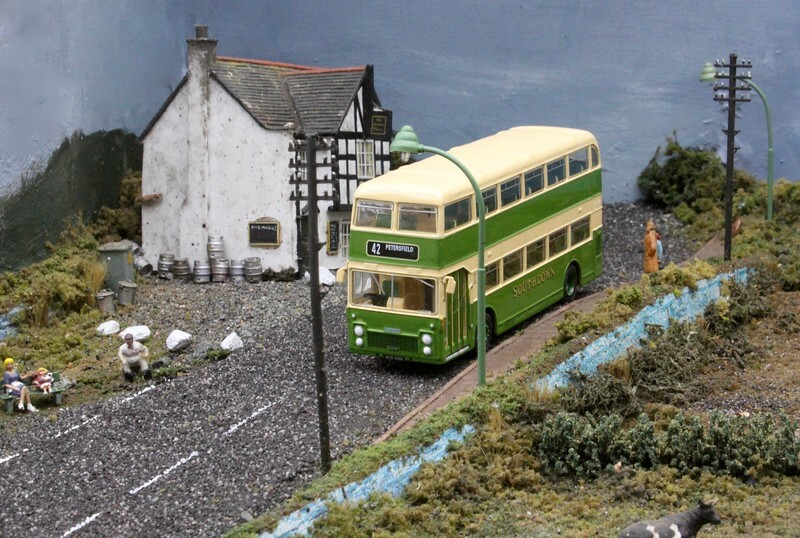 The Southdown "Queen Mary" Leyland PD3 open-topper proved as popular as ever for open-top tours. 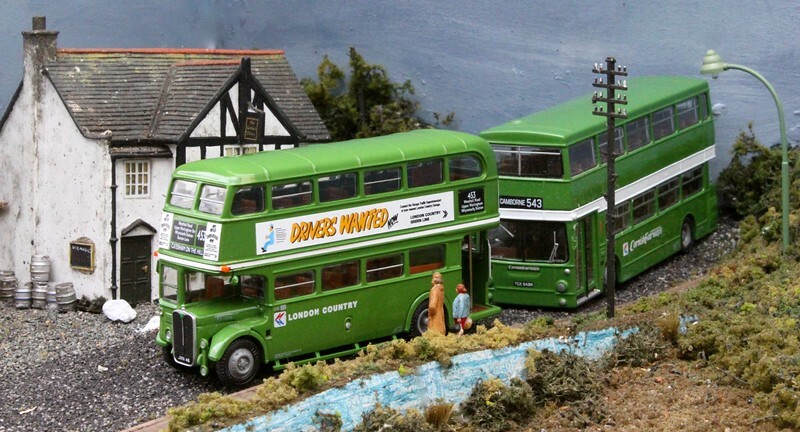 On the opposite side of the car park the London contingent comprised a long RML-type Routemaster from Upton Park garage on the 15 to East Ham, an AEC Merlin MB-type on the 81B to Heathrow Airport and country bus AEC Regal RF-type on the 435 East Grinstead town local. To the right of that RT1018 in its new NBC livery is on the 453 from Chelsham garage to Caterham-on-the-Hill, not normally a crew duty but probably standing in for a failed AEC Swift. The red Bristol VRT is in the livery of Hedingham & District, a long-lasting Essex independent which is adjacent to an AEC Reliance of Devon General on the 9 from Exeter to Sidmouth - a route and number still in use by DG's successor Stagecoach Bus. 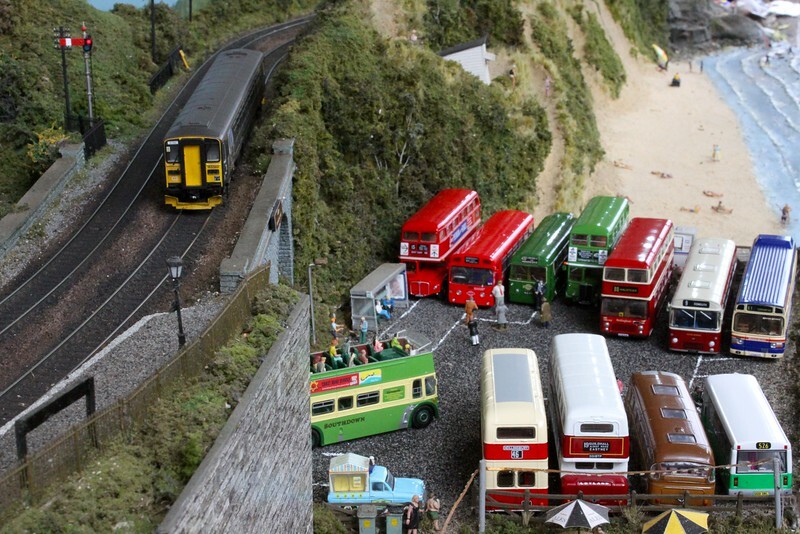 On the far right is a Leyland National of Western National, the operator local to the themed area, and one of a type imposed upon the operator by National Bus Company management. They were far too large and thirsty for Cornish rural operations and were loathed from day one. The livery is the second post-privatisation scheme. Out on the road runs a pair of former Green Line coach Routemasters pass at Treheligan station approach; on the left a long RCL-type claims it is on a 414 short working for Reigate while on the right is a standard-length RMC-type. Wearing full Green Line colours (pale green relief not bus yellow as on the RCL) the destination is set for route 15 to Paddington and shows this to be the preserved RMC1461 which ran in London on the 15 in these colours until very recently. RMC1461 is also one of the very few London buses I have actually driven. Another visitor on the road runs was this early Southdown Bristol VRT. The first of the type were split between the major centres of Brighton and Portsmouth with this one suggesting it is working the long route between Southsea and Petersfield which the type operated for many years. Finally a pair of London buses. Leading is RT1018 having temporarily escaped the car park display at Penhayle Bay while behind is a former DMS-class Daimler Fleetline of a type unloved in London (despite 2646 of them being delivered there) and despatched as hastily as possible to the provinces. Western National snapped up quite a number as cheap mid-life vehicles despite having no experience of the type previously and despite their 14' 6" height causing problems with low bridges and trees cut to suit the previous tallest vehicles at 13' 8". They replaced costly and life-expired crew-worked vehicles and lumbered awkwardly around country lanes for a number of years usually bearing scars of significant tree damage on the roof panels. Both buses wear NBC leaf-green livery with the RT having the "Mk2 logo" on a white square (previously it had been a white logo on the green livery) and the DMS carrying the Cornish Fairways branding authorised in the later years of NBC when they had realised that big and corporate wasn't best after all and a measure of local identity autonomy was returned to operators. London Country always used a very light shade of what was supposed to be NBC's "standard" green livery. It was far from that. The former red London bus behind shows a darker application while some factory-painted new buses arrived in an ever darker shade which was very drab. 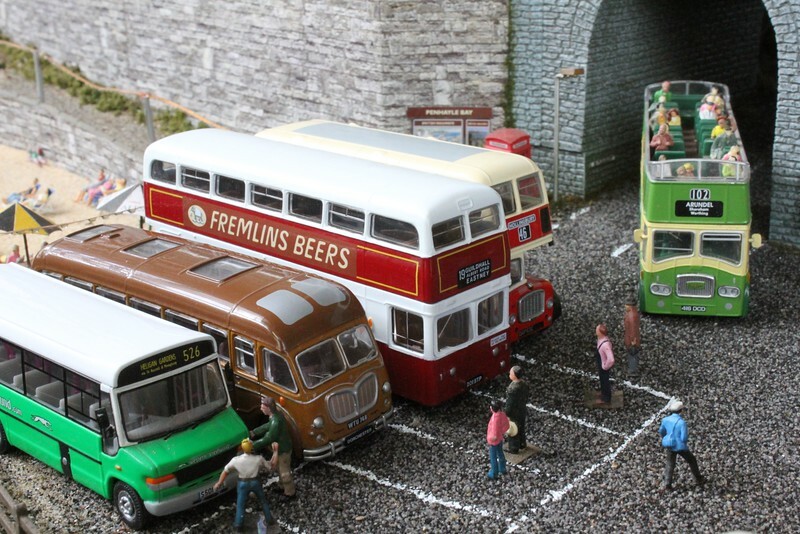 Some of these buses will still be around for Saturday's running day and there may be some others arriving as well. If anyone wishes to come and would like the address please PM me. Any chance of some more videos before closure Rick, (for posterity) ? I filmed a few clips on Saturday and hope to do more through the week. Whether I can manage another 20-minute You Tube movie is another matter. The intention is to capture more or less all types I have in the collection - some of which will also be sold - in operation however briefly. The eternal problem with a train video is that the train passes in a few seconds and that's it! As we move into November we are still waiting on Her Majesty's Department of Paper-Pushing and Rubber-Stamping to finalise Sharon's visa. Until she has that she cannot negotiate a start date at Kew nor a leaving date here. With the time moving on we now expect that we shall both still be here for Christmas which was at one stage thought unlikely. Plan A is currently that we both fly over whenever she gets the word and I then fly almost straight back. That's not cheap but might be a price we have to pay. In consequence of that I now expect that Penhayle Bay will be running right through the summer up until the advertised closure date of 17th April and will of course be ready to welcome visitors. It is proving very difficult to set dates which are convenient for a number of people together and I am happy to host visits by individuals at any mutually convenient time. I also hope to offer a "Penhayle at Night" running session taking maximum advantage of the lighting though strictly BYO mozzie repellant! You do NOT have to be a member of either Facebook or the group to see the list but if anyone is interested and is not on Facebook you would need to PM me via this site and not via the Facebook page. 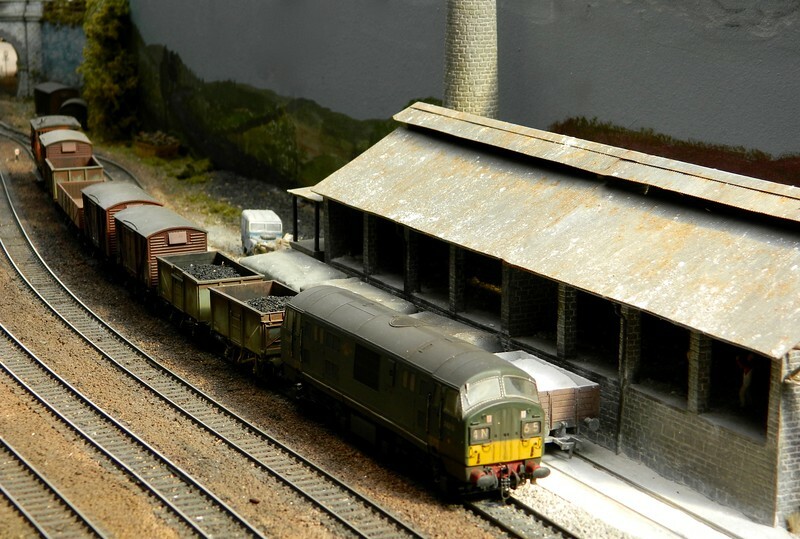 Some items of rolling stock have departed Penhayle Bay for pastures new. Those pastures range, currently, from nearby to New South Wales and Tasmania and as far as New Zealand. 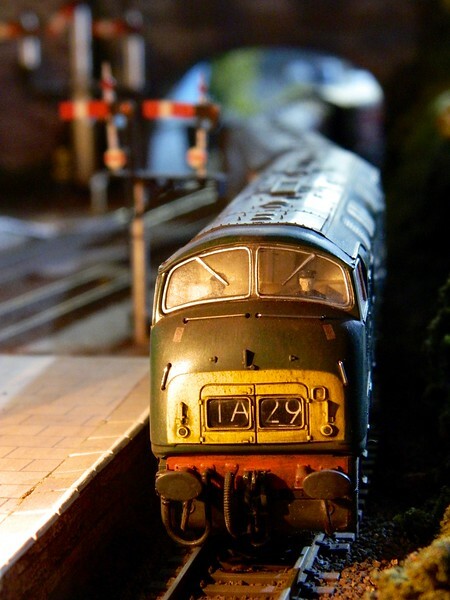 Also departed are the Hornby power-and-dummy pair of EWS-livery class 37 locos of the earlier Lima style. 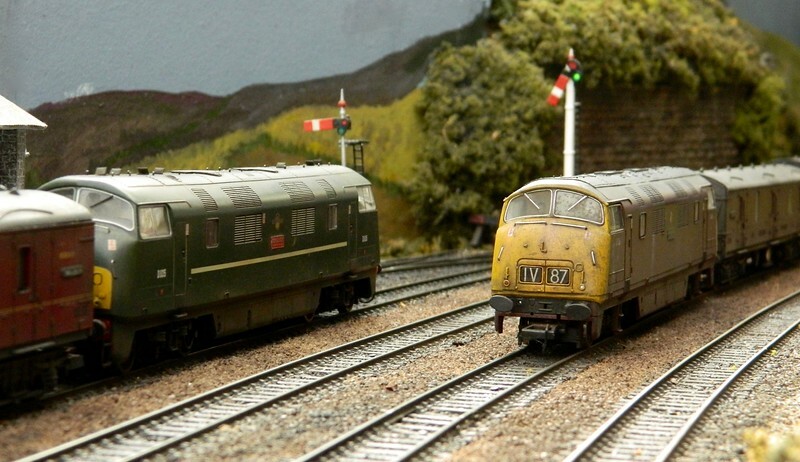 They look OK though Bachmann and ViTrains ones are much better and also run more smoothly. These locos have never been particularly successful here though a little additional weight in the nose-end above the power bogie would probably improve performance no end. 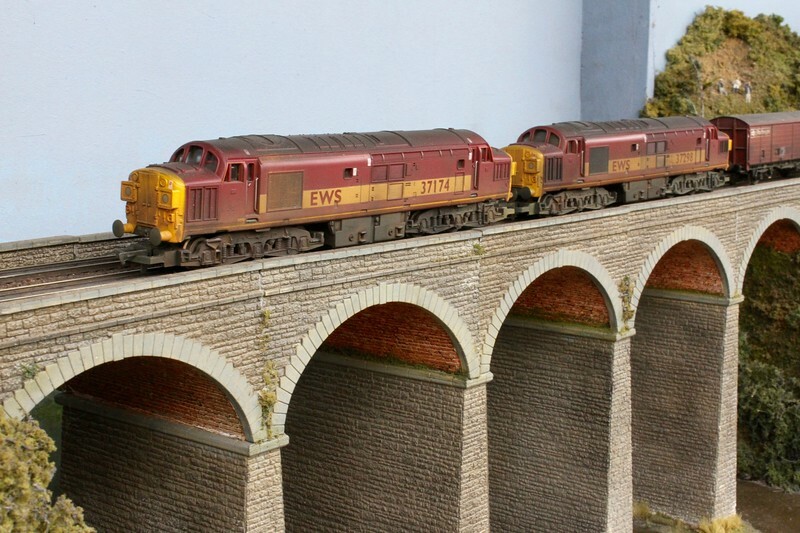 37174, the powered unit, leads dummy 37298 on their final working across Darras Viaduct. The weathering is a mixture of factory-applied and my own early attempts. Other items to have departed recently include the South West Trains class 170 DMU, one of the pair of class 158 units in Provincial Express colours (the other is being kept) and numerous carriages and wagons among which is almost the entire Inter City Executive livery Mk1 rake. Of ten coaches I am only keeping the restaurant car. The rake formed a railtour and charter set and saw very little use though appeared behind steam and diesel locos on rare occasions. 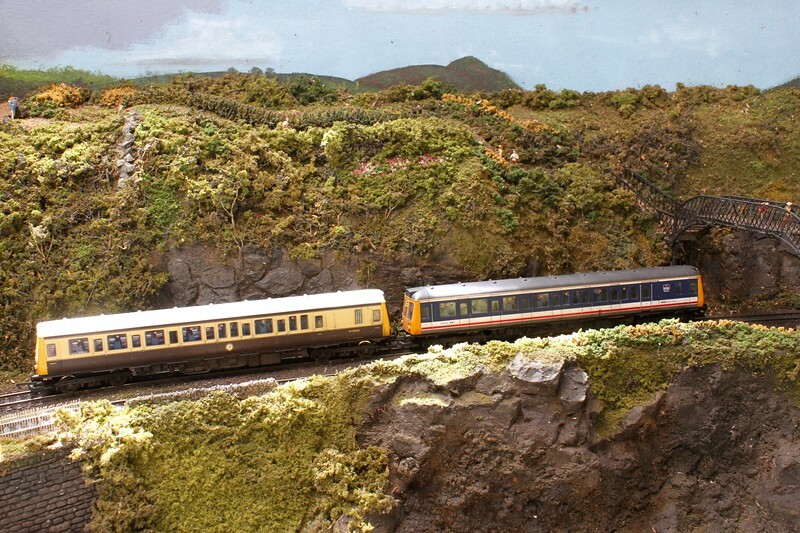 There is still a fair amount to be disposed of including a couple of illuminated Hornby Pullmans in almost unused condition and a 5-car class 221 Voyager unit in Virgin red livery. I can supply a list by PM to anyone interested.